Charcoal rot of stevia is caused by the fungus Macrophomina phaseolina. M. phaseolina has a host range of more than 500 plant species including soybean, corn, sweet potato, and other crops frequently grown in North Carolina. M. phaseolina was first observed on stevia roots in North Carolina in 2016. Symptoms of M. phaseolina on stevia begin with necrosis and wilting of stems (Figure 1) and can eventually expand into wilting and necrosis of the entire plant (Figure 2). Wilting from M. phaseolina can appear similar to wilt caused by A. rolfsii and S. sclerotiorum from a distance. However, upon inspection of stem bases, stem bleaching and white hyphae are not observed with charcoal rot. Hyphae of M. phaseolina turn black with age (video 1) and typically are not noticeable on plant parts in the field. When plants are pulled from the ground necrotic roots can be observed (Figure 3). Figure 1. Wilting of stevia due to Macrophomina phaseolina. Figure 2. Symptoms of Macrophomina phaseolina on stevia. Figure 3. 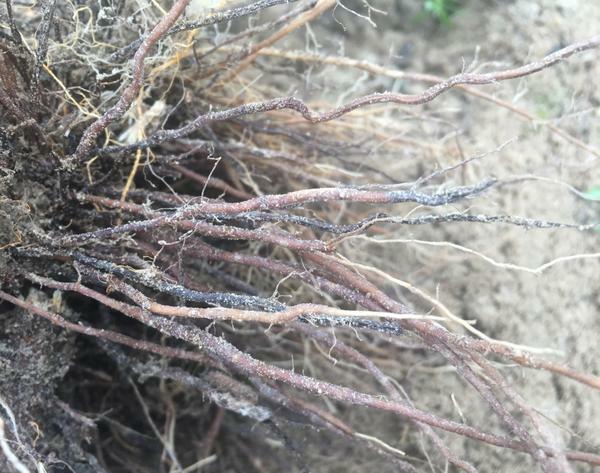 Root necrosis of stevia caused by Macrophomina phaseolina. 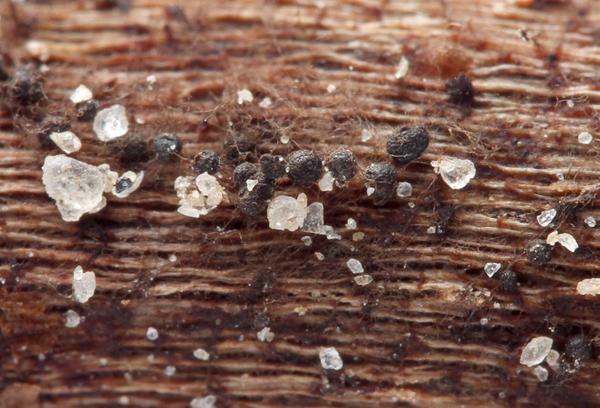 M. phaseolina survives in the soil and on plant debris as small, black, spherical microsclerotia (Figure 4). Germination of microsclerotia can occur throughout the season, but is favored by temperatures between 28 and 35°C. 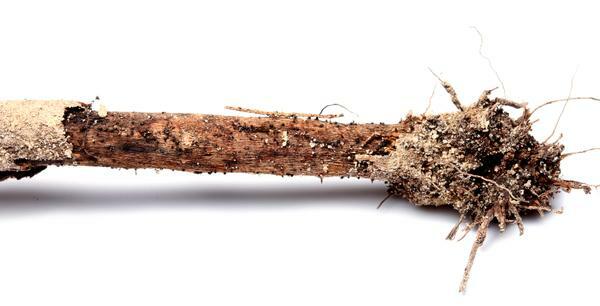 Hot, dry weather promotes the development of charcoal rot with above ground symptoms most frequently observed in July – August in North Carolina. Plants under stress from poor soil conditions, drought, or herbicide damage may also display symptoms of charcoal rot earlier in the season. M. phaseolina is able to colonize stevia roots and the impact of M. phaseolina on the ability of stevia to perennialize and successfully overwinter is under investigation. Microsclerotia of M. phaseolina have been observed on 2nd year plants that did not survive winter (Figure 5). Figure 4. Microsclerotia of M. phaseolina on a stevia stem. Figure 5. Stevia stem that did not survive winter, covered with microsclerotia of M. phaseolina. At this time there are no fungicides labeled for use on stevia. Research is under way to monitor microsclerotia accumulation and M. phaseolina disease levels during perennial production of stevia. Cultural practices such as maintaining soil nutrient levels and irrigating to avoid drought stress can be utilized to reduce environmental conditions favorable for disease. Kaur S, Dhillon GS, Brar SK, Vallad GE, Chand R, Chauhan VB. 2012. Emerging phytopathogen Macrophomina phaseolina: Biology, economic importance and current diagnostic trends. Crit. Rev. Microbiol. 38:136-51. Koehler A.M. and Shew H.D. 2018. First report of charcoal rot of stevia caused by Macrophomina phaseolina in North Carolina. Plant Disease. 102:241.